RJL Software - Support - FAQ - General Questions - A Security warning dialog appears when running your software, why? A Security warning dialog appears when running your software, why? After you install Microsoft Windows XP Service Pack 2 you may see a security warning dialog box when you attempt to run RJL Software product installers and trials that you have downloaded from our website. 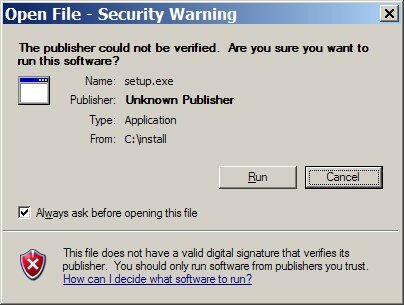 The security warning dialog box may indicate that the publisher of the file could not be verified, it says "Unknown Publisher". The text at the bottom of the dialog box indicates that publisher information could not be found, and the Publisher field is listed as Unknown Publisher. This is not true. You know who the publisher is. RJL Software, Inc. is the publisher of all software coming from this website. Trust us. To remove this warning dialog for all .exe files you can follow these instructions. In order to be a "trusted" developer with Windows XP SP2, we would have to purchase a digital certificate. Not just RJL Software, but any application that has not been signed with a digital certificate from a trusted CA (Certificate Authority) displays a message that the publisher is Unknown with a more forceful warning than in previous versions of Windows. This presents a problem for us smaller developers in that a code signing certificate from Verisign costs $400/yr or more. Since all of our software is downloaded from the Internet, the Unknown Publisher message might make the you think the software is spyware, and should not be trusted. Even worse is that your company wide policy may prohibit the installation of our software no matter what you think. The red shield as shown in the screenshot above is the same one used in the Control Panels Security Center, which indicates a serious security risk - however it is not. "As software publishers create and file their digital signatures, there may be a transitional period during which many reliable software applications will not yet have a digital signature. Even without a digital signature, users are able to click the Run button to confirm they want to install the software. The installation will proceed as normal."